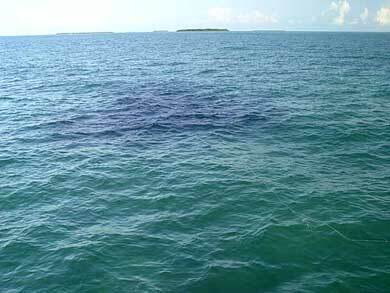 A large school of tarpon on a deep flat can look like a big, purple blob (or "wad") beneath the surface. AS A FORMER GUIDE I have a backlog of thousands of experiences of trying to see fish in difficult situations and helping others see the same fish I did. I’m reminded of this every time I fish with a guide now who doesn’t quite get how important it is. On a spring creek, a guide might say, “They’re eating emergers,” without looking up from his fly box or offering any clue as to how he can tell this, though I know it’s from visual clues about the rise. A poor flats guide who doesn’t know the importance of seeing fish will offer something equally minimalist like “There he is,” leaving the way he turns the boat as the best indication of where the fish might be. I’m going to abandon empirical wisdom from the outset and suggest that visual acuity has little to do with the ability to see fish. It might help explain, though, why inexperienced guides fail to communicate the information they use for fly selection or presentation strategies. Most of what we’re using to actually help ourselves spot fish in the water has to do with noticing events on periphery of the fish, not the location of the quarry itself. You can prove this to yourself by trying really hard — and we ‘ve all done it —to focus on the location of a fish that someone else already sees but that is still invisible to you; you can’t help but start worrying whether you’ll see the fish, and so you narrow you search even more, blocking out all the other little things that would actually help you find it. The ability to see fish is a learned behavior. Even someone with bad distance vision can learn to see fish on the saltwater flats at hundreds of feet away. I’ve seen it happen. And one of the wonderful facts about trout fishing — or fishing at night for big bass — is that there are an incredible number of other clues to the events as they happen that not only reinforce, but are more telling than, what actually hits the retina. 1. Relax. It’s the absolute requirement for seeing better. Some excellent anglers I know are able to meditate while on the water and immediately “get into the groove” of seeing what’s actually going. Others suggest putting all extraneous thoughts aside, which is a form of meditation itself. 2. Be Confident. Even if you have 20/15 eyesight, if you don’t believe that you will see fish, you won’t. This is perhaps the most difficult hurdle for beginners to overcome. Start thinking you will see fish — not just this or that fish, but every fish that comes into range — and you will dramatically increase your ability to see. 3. Find Polarized Lenses That Suit Your Eyes. Despite what almost every magazine article ever written on the subject has to say, there is no perfect pair of sunglasses for all fishermen. After trying close to a dozen different “brown” or “amber” lenses from various manufacturers, I found the one that is best for my eyes; most certainly these lenses provided the right combination of optics, polarization filters and color to enhance my vision. They are categorically not the best lenses for everyone, since everyone’s eyes are different. But since you’re a human being with a physiology that evolved for daytime hunting, what you are looking for is lenses that give you both a high degree of color differentiation and as much light as possible without being tiring. 4. Think More About Fish Behavior. I’m often told stories about Bahamian fishing guides that see bonefish miles away without polarized glasses. I always end up thinking, Well, why don’t you just add that they know what time lunch is without looking at their watch? Once you have a large enough foundation of knowledge about the behavior of your quarry, where they do it and why, keeping your eyes on them becomes much, much easier.